EEANM hosted a live Q&A on Facebook October 17-21. Our advisors, candidates, and newly certified educators shared their thoughts about EE Certification. We’ve pulled the questions and their answers together in this blog post. If you’re considering an application or just want to learn more, we invite you to read their discussion. Feel free add your question in the comments area below! And be sure to like our Facebook page to join in future conversations and get updates about environmental education in New Mexico. What if you already have state teacher certification – does it still behoove one to be EE-certified? The EE Certification has many competencies that are unique to the field of EE like understanding the history of EE, knowledge of natural history, understanding climate change, and adapting to learners in various settings (like the outdoors). There is an opportunity to be involved in a learning community with other like-minded educators and to learn from one another. Tammy Maitland: It’s definitely a different focus- some parts apply to teaching in general but most is tailored to environmental education specifically. It’s a bit of a time commitment but is there is a lot to gain from doing it! How much time did you work on this program each week, and how did you balance that with your job duties/life? Tammy Maitland: I didn’t really have time during the week due to work/life duties, but I would dedicate time on the weekend, mostly as a deadline approached. I used a good chunk of time the last 3 or 4 weekends before the final submittal was due, and then another weekend day to work on revisions, for example. Rink Somerday: Someone had mentioned time commitment. I admit, I work better under a close deadline. I spent a few full days writing up my portfolio rather than a few hours a week. However, it was never far from my mind so if I came across a good article or conversation with someone, I would take notes on it for later reference. Do you have any tips for potential candidates as they prepare their applications for the program? Eileen Everett: To really read through the materials and take the time to review the self-assessment before applying. The process will support you to grow as an educator, but it is helpful to understand what competencies are required. Tammy Maitland: Read any of the provided materials carefully to make sure you have a good understanding of what the entire certification process consists of. Rink Somerday: As you read through the self assessment take notes. I sat there and thought, oh yea, I did so-n-so. Then when I went back and started writing I couldn’t remember what that great thought was. What part of the process was the most difficult and what part was the most fun? Rink Somerday: To me the most difficult was using Google Drive. I am not a tech person so understanding who to share things with was hard (I still have a paper calendar). The funnest was answering the criteria of my professional development of what and when. Going back over past calendars brought back some great memories of conferences I have presented at and attended. Tammy Maitland: I would agree that using Google Drive/Documents was hard, and time consuming. We were given the option to submit things on a flash drive or email, etc., but I guess I was stubborn! Some competencies were hard to answer, but those were also some of the fun parts for me, because they got me thinking about things and are still keeping my mind working after the fact! Eileen Everett: For me, the most difficult part was making sure to make enough time for writing up my portfolio. The most fun was getting to work with the other candidates and advisors in a learning community! 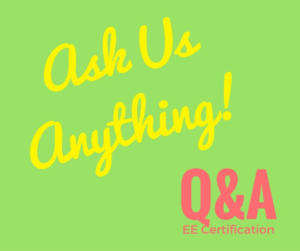 Do you have other questions or comments about EE Certification? Let us know in the comments below! I appreciate the info from the article, very helpful. I was having trouble with the Google drive part of it as well but this explains things. Glad this was helpful, Stella. If you have any other trouble, please feel free to ask Eileen for help!